The California Academy of Sciences has an exhibit about earthquakes, so of course, it has ostrich chicks. You don’t see the connection? Neither did I, actually, but I had to see the ostrich chicks. As a member of the Cal Academy, admission is free and I can guiltlessly just drop by. That’s what I did today, just to see the ostriches, and was directed to the end of the building. But the enclosure was empty. 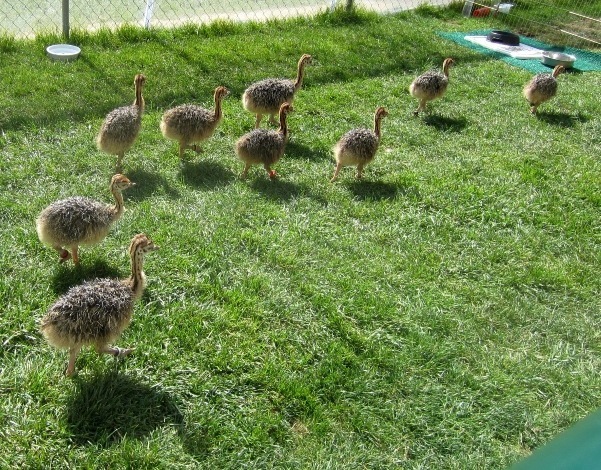 The ostrich babies were actually outside, being exercised in a large pen in the sunshine. These little guys were 20 days old, and as you see here, still fuzzy. The fuzz is actually rather like dry grass in texture, and doubtless helps conceal them on the African plains. Ostriches form harems, with 6-7 females and a male, and lay eggs in a communal nest. The females incubate it in the day, the male in the night. When the chicks hatch, they’re ready to run with the flock. In nature, they’d be chasing their mother around the savanna, much like outsize chickens (or she’d be chasing them). 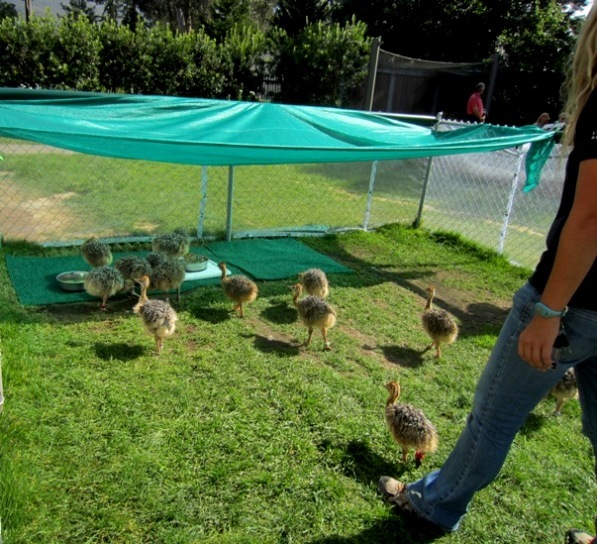 The Academy chicks are indoors much of the time, and so this outdoor exercise time is important to their development. They came as eggs from a ranch in Escondido, the docent explained, and were hatched in an incubator at the Academy. As they outgrow the exhibit, they’ll be sent to various zoos, or back to the ranch. The Academy hatches a new batch every few weeks. 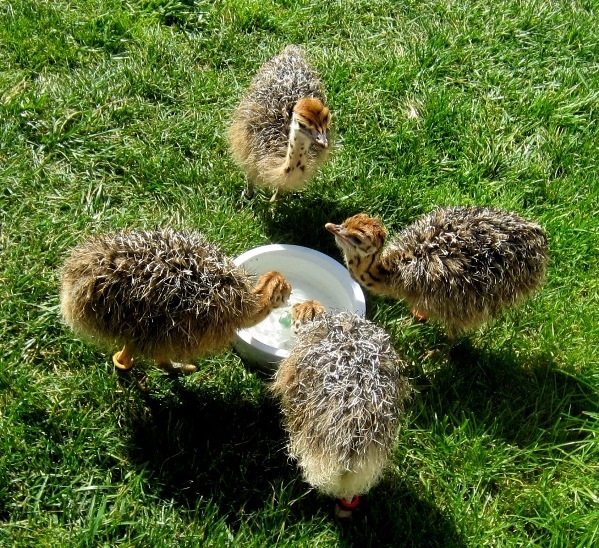 I’m wondering if these little chicks are going to imprint on humans… I was reading on the internet that they do, sometimes, and then the males will direct its mating displays to its human attendant instead of the female ostriches. Oh, and the connection with earthquakes? Well, it’s plate tectonics. As the earth’s tectonic plates separated, they parted related birds onto different continents – emus and rheas and ostriches. They’re all flightless rattites, but each evolved flightlessness separately. Plate movements also cause earthquakes. 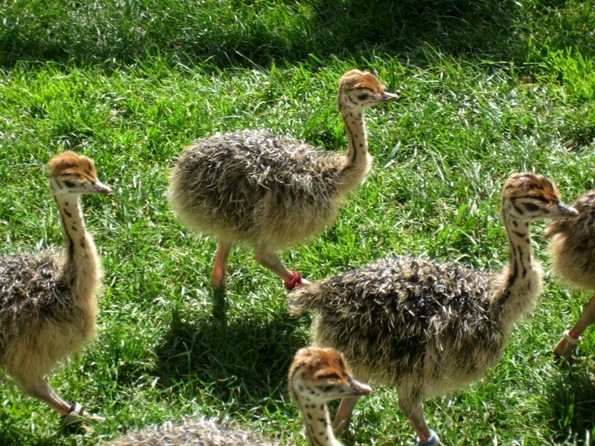 And if the connection still seems a bit far-fetched, it’s a good excuse for a display of fuzzy ostrich-babies.